Performance. Style. Luxury. At Smith Motor Sales of Haverhill, we know these concepts matter most to Mercedes-Benz drivers from Massachusetts and New Hampshire, and we provide vehicles to meet their needs. Our MA Mercedes-Benz dealership is committed to finding the perfect vehicle for every driver who graces us with their business, and we believe our customers deserve an automotive experience commensurate with the Mercedes-Benz name. 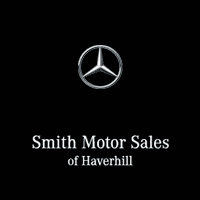 Drivers from Lawrence, Andover, Methuen, Newburyport and beyond can turn to Smith Motor Sales of Haverhill for our incredible selection of new and used Mercedes-Benz vehicles. From popular sedans like the C-Class and S-Class to refined SUVs like the GLA and GLE, we offer all of Mercedes-Benz most popular new models. And with our host of used and CPO Mercedes-Benz vehicles, plus pre-owned models from other luxury makes, we can also help you find a great offer on a new-to-you car or SUV. Our Mercedes-Benz dealership near North Andover and Andover also serves as a service and repair center, providing New England drivers with a dedicated team of Mercedes-Benz technicians. Whether you need a routine repair or major maintenance work, Smith Motor Sales of Haverhill can help you. And with an impressive collection of OEM Mercedes-Benz parts and accessories, we can help you personalize your Mercedes-Benz vehicle, too.